A landslide susceptibility map forecasts where landslides are expected to occur in the future based on terrain conditions, including local morphological, geological, and land use settings. Using different colors, a landslide susceptibility map shows forecasted levels of landslide susceptibility in a region. 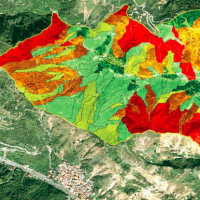 Using specific software, LSMMs can be prepared whene new landslides or new environmental (e.g., morphological, geological, land use) data is available for a region of interest. Existing LSMMs can be validated using event inventory maps prepared after a major triggering event. Civil Protection authorities can exploit LSMMs in landslide regional or national early warning systems to improve their response capacity. Planning & development authorities can use LSMMs to identify landslide prone areas and to zone a territory accordingly. Transportation authorities & utility managers may expoit LSMMs to forecast the potential impact of landslides along transportation or utility network, and to improve maintenance strategies. Agricultural & forest agencies exploit LSMMs to identify landslide prone areas, for improved agricultural and forest management. Scientists use LSMMs to forecast the expected climate and environmental changes on landslide abundance and activity.